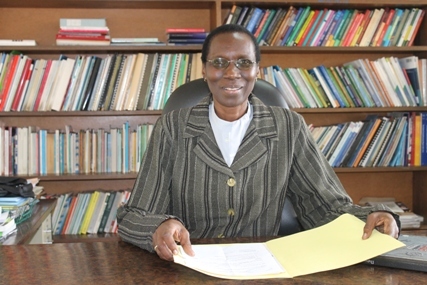 Prof. Winnie V. Mitullah is currently the Director, Institute for Development Studies (IDS) of the University of Nairobi and an Associate Research Professor of Development Studies. She has a BA and MA in Government from the University of Nairobi, and a PhD from the University of York, UK. Her background is in political science and public administration specializing on local governance, in particular policies and regulations relating to provision and management of urban services. She has taught, consulted and conducted extensive research within Kenyan and the African region, collaborating with a number of local, regional and international agencies. Her research areas include institutions and governance, in particular decentralisation with publications in the areas of urban development focusing on policies, politics, service delivery, gender and development, media and development, associations of small scale enterprises, and poverty alleviation. Winnie is currently the lead National Investigator (NI) for Kenya and Core Partner Director for the Eastern Africa region of the Afrobarometer Network, the independent, nonpartisan research project that measures the social, political, and economic atmosphere in Africa; Chair of the Kenya UNESCO Secretariat Committee on Social and Human Sciences and member of several boards and technical committees. Previously, Winnie served as a member of the Kenya Government Task Force on Devolved Governments; chair of the UN-HABITAT Advisory Board on Global Research Network on Human Settlements (HS-Net); Vice Chair, Kenya African Peer Review Mechanism; and Director of Urban Policies programme of the Women in Informal Employment Globalising and Organising [WIEGO]; member of the Board of the International Foundation of Training (FIT), and member of the Kenya Gender Commission.